Reporting & Analytics: We offer specialized web analytics services. Get more information on our reporting & analytics and sub-services. Search Engine Marketing: We offer specialized web analytics services. Get more information on our search engine marketing services and sub-services. Web Analytics Services Articles: Our web analytics services resources are comprehensive and well-researched. 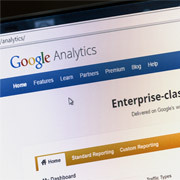 Check out our web analytics services articles. What can be measured using Web Analytics? A/B Testing & What and Why? We discussed about the reporting requirements and together we came up with a format that was acceptable to the client. Segments: How would we divide the website and its audience? After receiving the inventory, we had to create the segments which would capture the data in Google Analytics. These being: Geographical and Business Units. This turned out to be the easiest thing to do. Since all we wanted was to segregate the overall GA profile data into regional pools. So from the Master GA profile we fed data into child profiles with the help of Include filters for the countries that belonged to a particular region. This was more complicated. None of the page URLs followed a consistent naming convention. And for reasons of SEO they were loathe to change it. That is why we had to adopt a more complicated strategy of feeding traffic data to multiple GA profiles. We modified the GA JS code to feed data into multiple profiles, which we will review below. All traffic information from www.metricstream. is captured by this profile. Captured data includes all pages, all segments and all geographies, except for certain exceptions like internal traffic etc. All pages belonged to a particular industry and solution, therefore each page reports to 2 profiles, one each of solution and industry. The tagging of the pages was implemented by MetricStream according to our Guidelines. After the tagging was completed, we checked that all profiles were recording data and then we moved into the reporting phase. One of the primary ways to measure success for the site was the registration process. MetricStream seeks to reach out to customers and potential customers by making a wealth of mixed media content available once they leave their contact details. There were 3 types of registration paths, but all of them had to increment the same Goal counter. To accomplish this we had to create custom JS scripts to capture the correct information for the Goal module to work. The whole project gave MetricStream visibility into their website which they didn't have earlier on. From tracking key KPI metrics, not only across the site, but also across the different areas of operation for their organization. Contact us to outsource web analytics services or to implement Google Analytics. We will get in touch with you within the next 24 hours. Our web analytics services have created global success stories.